SZV Social & Health Insurances (http://www.uszv.org/?lang=en) is responsible for implementing social and health insurance for the country St. Maarten. Their vision is to strive for a sustainable quality system of social and health insurance for St. Maarten. SZV is an excellent service provider in the field of implementation of social and health insurance. SZV has three important pillars: “Customer Care”, “Quality Care” and “Sustainable Care” and serves all of their stakeholders: the executive council, the health sector, employers’ organization (s), trade unions and residents. SZV aims for a sustainable and high quality system of social and health insurance, from both a ‘cost-consciousness’ and a ‘development perspective’. SZV wants to be a guiding and defining institution for the country St. Maarten and its citizens. “SZV, Because We Care” is not an empty phrase but a real ambition. As part of their customer care process, SZV decided to design and implement a customer management system that included print on-demand color appointment cards. · Date of the appointment. · Time of the appointment. · Number of the front office desk. · Additional (and changeable) text information for the customer. For this application, SZV used a photograde, inkjet receptive, 8 mil, tag stock from General Data. Print on-demand appointment cards with serialized ticket numbers and variable data/graphics would seem to work for many different customer-oriented service providers; healthcare, government, etc. 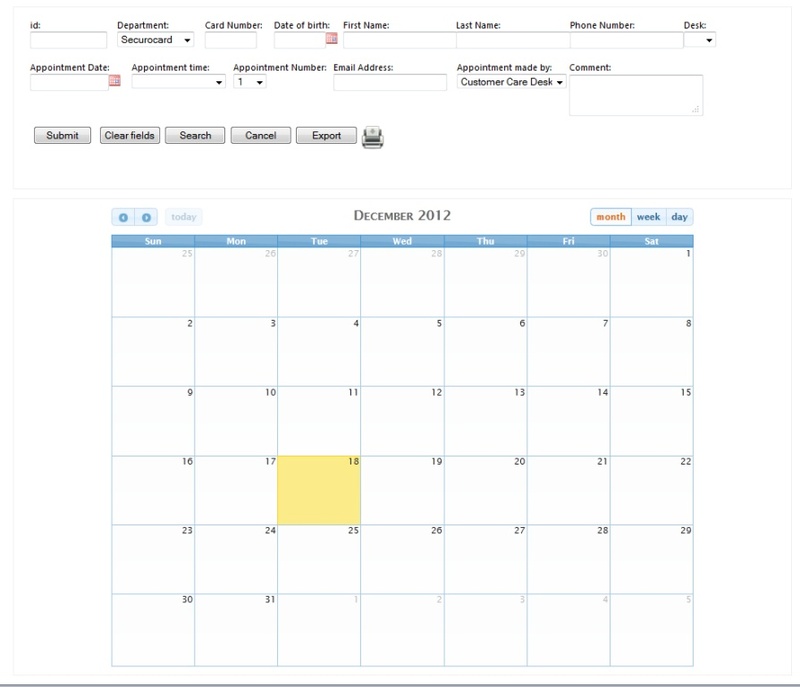 Talk to your colleagues or customers about how print on-demand appointment cards would work in your operation. This week, two stories covering my customers were published that you may find interesting. 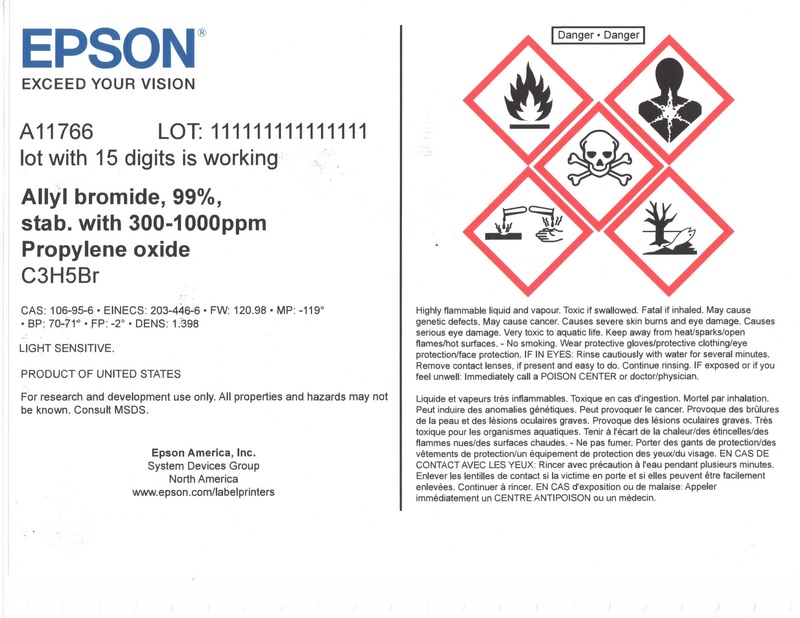 These stories represent great targets for print on-demand color labels; Manufacturers with a large number of SKU's and Chemical Manufacturers who need to comply to the GHS initiative. The deployment at Jaclo has been a great success; increasing sales and saving them labor/time. The deployment has worked so well, Octochem has purchased more printers. If you or your customers have lots of SKU's or need to comply to the GHS initiative, be sure to look into using print on-demand color labels. You'll be glad you did. 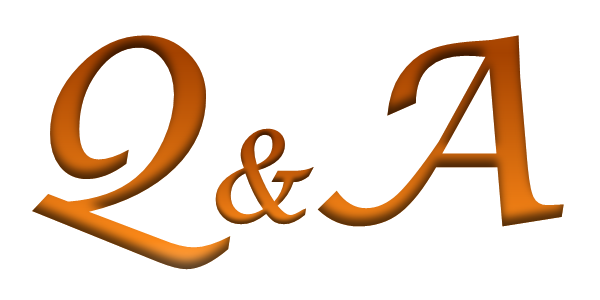 One day this week, I received three questions from readers of my blog. These questions excited me for two reasons. First, I appreciate any and all questions concerning print on-demand labels. Your questions have led me to discover new potential applications or to learn something new myself. Second, these three questions came from people I would never had communicated with except for my blog. My goal with this blog is to help value added resellers and end users become aware of and begin selling/using this technology. Your questions help me measure my achievement of this goal. I read your blog and was wondering if you would be willing to take a quick moment and help us choose between the Primera LX900 and the Epson TM-C3400 printers? Our need is for small run color labels for nutritional supplement samples bottles. 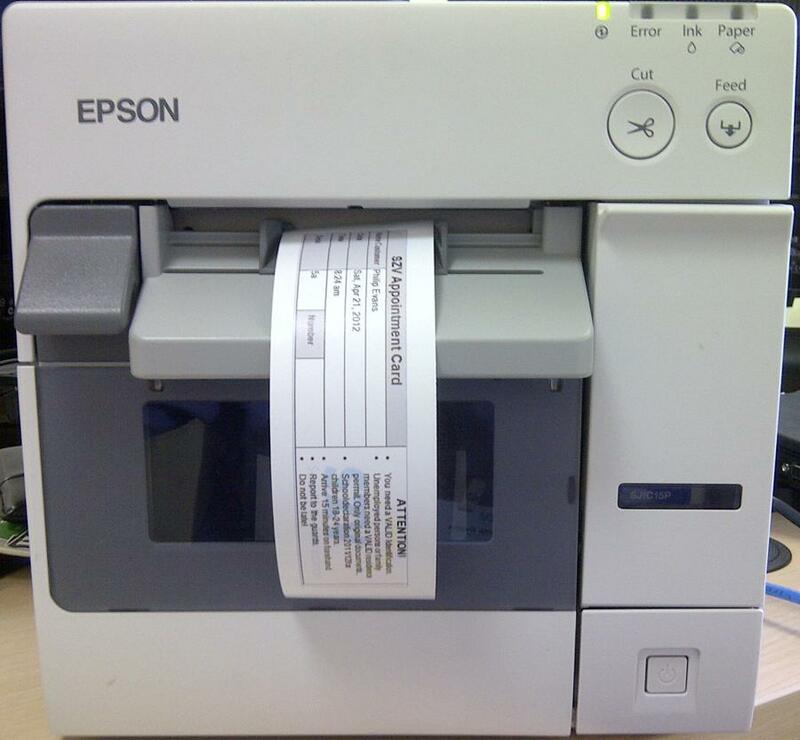 We anticipate printing 50-100 labels at a time, up to perhaps 1000 max. We probably won’t print more than 1000 labels per month. We will want to print on water and smudge-resistant stock. Initial price is not a driving factor although ongoing per-label cost is a consideration. Vendor support and availability is important. Thanks for connecting; and for reading my blog. Here is what I tell people about the differences. If you are printing labels with 100% coverage of ink, I recommend the Primera LX900. This printer has higher resolution and 4 colors; which makes for better full-color pictures. However, if you are adding color images, text, graphics, logos, barcodes to a white label, then the TM-C3400 is the best choice. First the ink is much more durable. Epson uses an encapsulated-pigment ink; not the dye based inks in most printers. Second, the TM-C3400 consumables (ink and media) are typically much less expensive. As Epson works with converter partners and not sell media, label costs are usually less than the media sold by Primera. Depending on what you print, the total cost is significantly less. Third, the TM-C3400 is much faster and much more durable in production. I've talked to lots of people who had issues with the LX900 in production. This printer is fine for a graphic artist doing a few labels; but not so much on the factory floor. 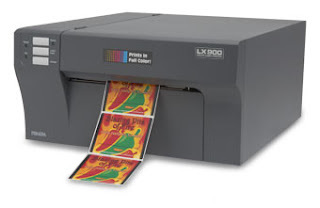 Although a different printer, you may find this story on the Primera PX450 of interest. Finally, the TM-C3400 offers a good Ethernet capability; which you may need. 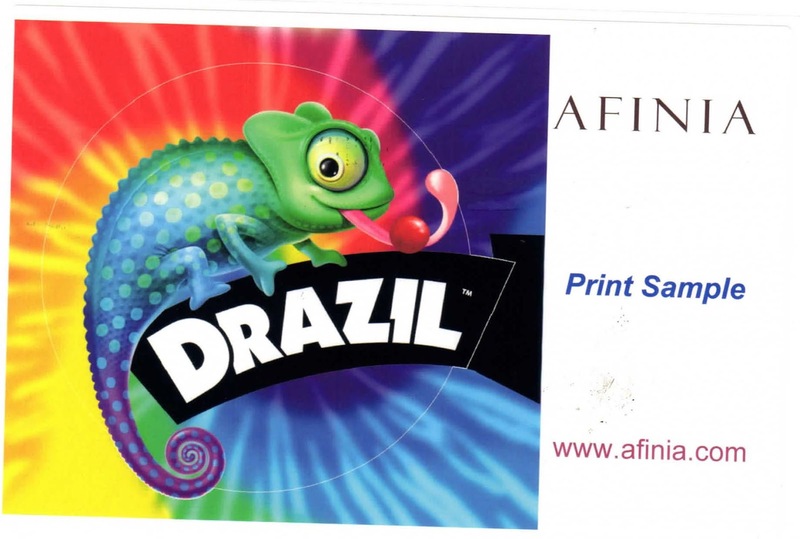 You might find these previous posts covering previous Primera printer users of interest. As for support, you can contact me anytime; especially when you first start. I do many 30 minute webinars to help people get started quickly and easily. Plus, you can call Epson Advanced Tech Support at 562-290-1314 OPTION #3 for help. Also, Epson sells extended warranty and a Spare-in-the-Air which enables you to get a different printer next day if your printer breaks. SITA costs $61 a year. This program seems like a great deal to me if you don't want to keep a hot swap. Feel free to contact me next week to talk more. All the best. I ran across your blog on color label printers and am hoping you can help me. I manufacture lubricants and I pack them into 55 gallon drums and 5 gallon pails. 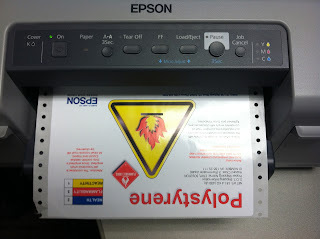 I currently print my labels on a Dell 3130cn color laser printer (http://accessories.us.dell.com/sna/productdetail.aspx?c=us&l=en&s=gen&sku=224-0485) and use 8.5"x11" online labels weather proof polyester printer (http://www.onlinelabels.com/Products/OL175LP.htm). I print about 250-500 labels per week. Due to the thick paper, the Dell continuously jams. The current set-up is no longer sustainable. I was looking at the Epson GP-C831. Seems this is the printer I am looking for. But I have a few questions and can't seem to find anyone with the information. Where do I buy the paper? Are there labels available for this printer that are "weather-proof"? I currently print label size of 8.5"x11", I assume I will have to reformat to fit the 8"x" setting? And of course, where can I buy this printer? From your description, I agree with you; the GP-C831 should be a much better alternative. First, the pin-fed media handling was used to insure reliable media handing. Many times, sheet-fed printers have the problems you mention; they are much more likely to jam. Second, the on-going ink cost with the GP-C831 should cost you at least 50% less than color laser; a big savings over time. The cost to refill all three ink cartridges is $106, with thousands of potential labels per set of 4 cartridges. Just last week, I spoke to a reseller who said it cost over $1,200 to refill toners in a 4 color laser printer. Send me your label samples so I can print and return them to you. Third, the Durabrite ink used in the GP-C831 is very durable; and has the BS5609 certification you may require. Check out my previous blog post on this topic. I’m sure others converters will offer this media shortly. 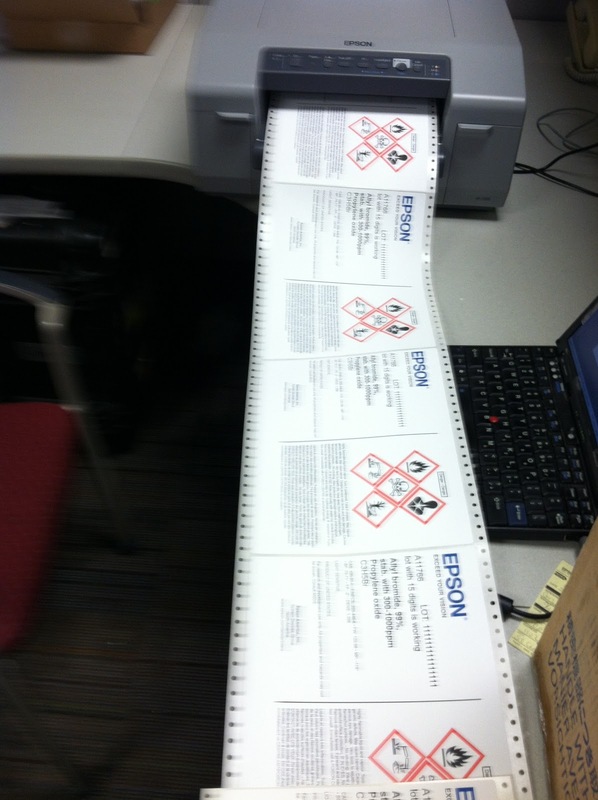 As for where to purchase the printer, Epson has not officially released it yet. I understand you should be able to purchase the GP-C831 after the middle of December. After this date, I can recommend a local Value Added Reseller for you to purchase the printer. PS: If you 5 gallon pail labels are less than 4.4" wide, you may want to consider using the TM-C3400. I've been reading your blog and appreciate all the useful information you posted. I am a label converter and need to source the subject material. Can you suggest a supplier for the adhesive coated label stock? 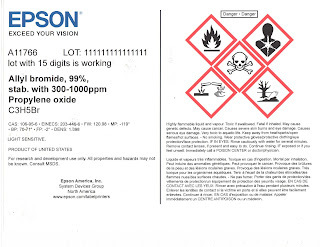 For paper labels, you may want to contact Fasson. For poly labels, you may want to contact Neenah Paper. These companies manufacturer facestocks. Also, you may want to contact Wausau Coated to purchase the total construction. Be sure to get me involved on your selling or training efforts. I help end users get started all the time. Let me know how I can support you. Let me know if you have had similar questions and if the answers help. Also, send me any other questions you have on print on-demand color labels. As I said, they me learn; and sometimes provide more content for my blog. Pacific Labeling Integration (PLI) www.pacificlabeling.com is known for high quality products and system design. 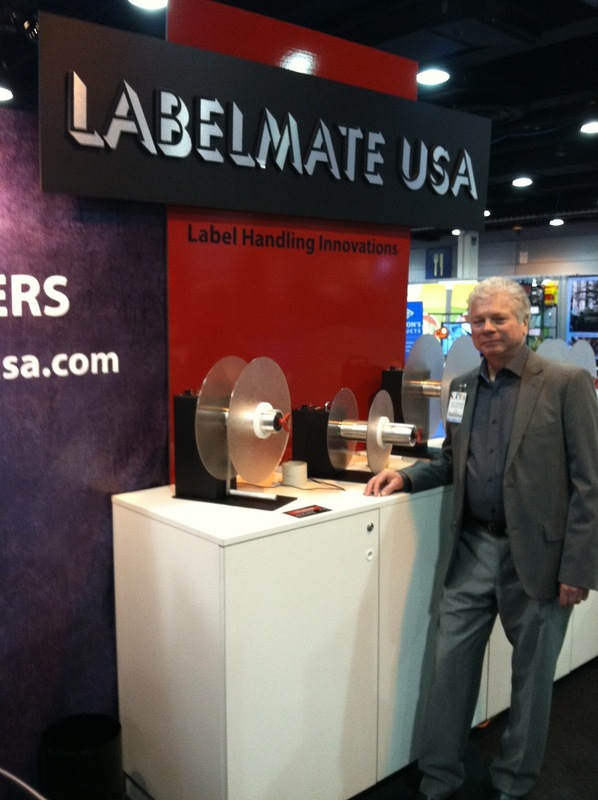 PLI leads the way as one of Label-Aire's most respected distributors. The staff of PCL serves the labeling needs of their customers; from product sales and repair to development of the most reliable, cost efficient, and creative labeling solutions. At Pack Expo, (http://colorlabelsondemand.blogspot.com/2012/11/pack-expo-2012.html) I met Robert Claproth, President of PLI; and we agreed to meet in their Ontario, CA office after the show. 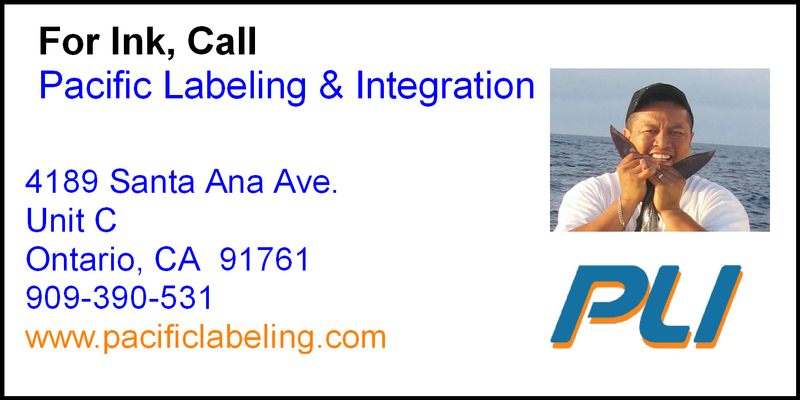 “I’m interested in adding new labeling solutions. Bringing new solutions to our customers has been the key to our success. 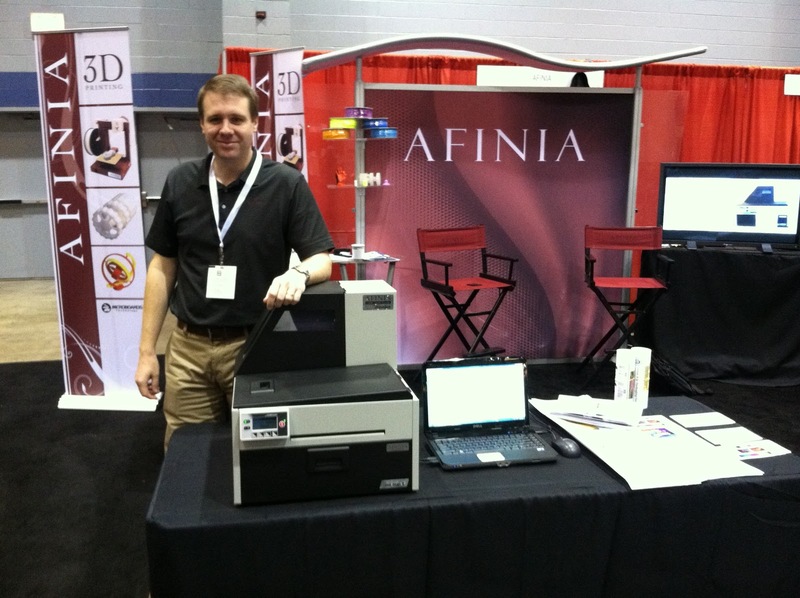 Plus, we love to sell ink; as we sell ink to our customers with continuous inkjet coders/markers”, says Robert. If you want to learn more about continuous inkjet printing, check out this description from Wikipedia: http://en.wikipedia.org/wiki/Inkjet_printing#Continuous_inkjet. While demonstrating the TM-C3400, Robert knew that he had an immediate need to use this label printer; labeling his ink. As a reseller of ink, he wants to make sure his customers know who to contact to reorder ink. "As a reseller of a consumable item, it’s important that my customers know immediately how to reorder. I see a real advantage placing my color labels on the inks I sell to make it easy for customers to reorder. I’ll begin placing my labels on inks I sell”, says Robert. And Robert wanted to purchase my demo printer! Although I could not sell him my printer, I did get a commitment from Robert to purchase a printer; and to contact me once he has the printer. For new users like Robert, I conduct a 30 minute webinar to insure they start using the TM-C3400 quickly and easily. And for new resellers like PLI, I conduct sales training; focusing primarily on the best target customers to sell print on-demand color labels. For new resellers, I work with distributors to get them registered to sell the Epson products. 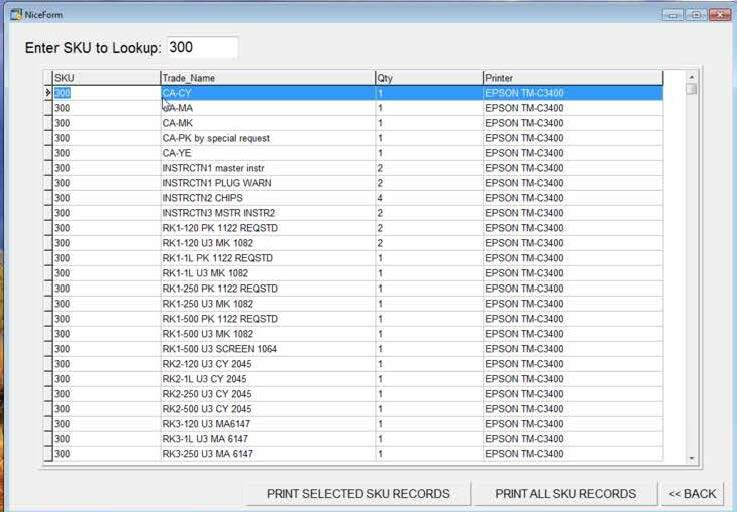 As PLI purchases from one of them already, it is an easy process to begin reselling print on-demand color labels. If you are a reseller of consumable items, consider using print on-demand color labels to make it easy for your customers to reorder. It's a great idea! 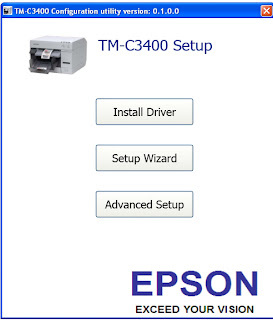 To help you and your customers start printing on-demand color labels, I like to give you my personal “Quick Start Guide” on using the Epson TM-C3400. As printing on-demand color labels is different from using a thermal transfer, monochrome printer, I want to make sure you get starting quickly and easily. 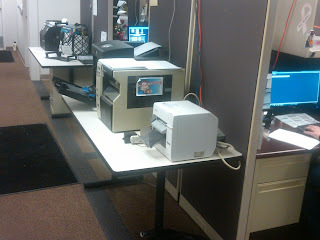 Every week, I help people begin using this printer; and want to share what I have learned through all these webinars. First, unbox the printer, plug in the electrical and USB/Ethernet cords and insert the paper from the box into the printer. 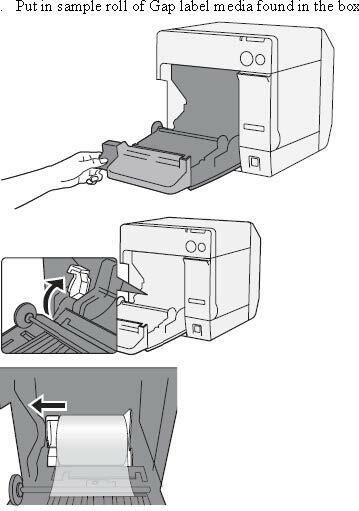 To insert the paper, open the front door by pulling up the lever on the left side, lifting the blue lever on the inside of the printer, placing the roll of labels between the silver disk on the right side and the blue lever on the left side, pushing down the blue lever and pulling the leading edge of the paper out the top as you close the front door. Second, insert the ink cartridge into the printer. Third, turn on the printer. After turning on the printer for the first time, the printer will run approximately to 7 minutes. This initialization process fills the lines to the printhead with ink; consuming about ½ of the starter cartridge that comes in the box. You will find the driver as the first item under the driver section. 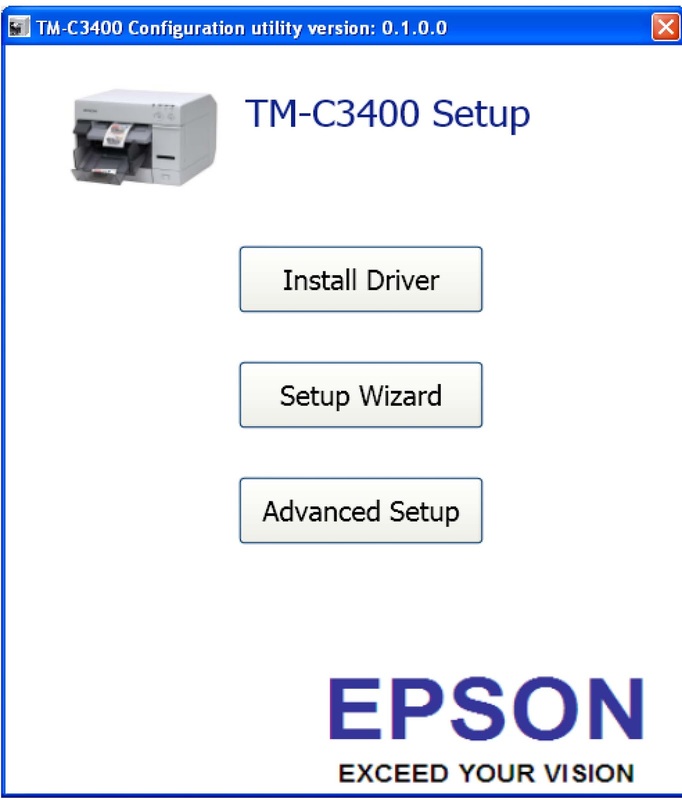 The third item is the Easy Setup Wizard that enables you to install the driver and answer the questions required to start printing. The Wizard may be the easiest way to start printing. This step sets the size of media you want to print. Other sections include Media Settings (Type and Quality) and Cutter Settings (Auto Cut and No Auto Cut). This Easy Setup makes it simple to configure about 80% of the TM-C3400 settings. As a new utility, this Wizard makes it significantly easier to use the TM-C3400. If you or your customers have a TM-C3400, try it. If you chose download the driver directly, follow the next set of instructions. Please remember to designate and remember to what directory/location you downloaded the driver. After downloading, please decompress the driver and look for the EPSetup icon in the driver folder. After starting the setup, you will have the opportunity to install the driver for a local setup (i.e. USB) or for a Network (Ethernet). In the network install, the driver should discover the printer automatically and enable you to manually set the IP address if desired. 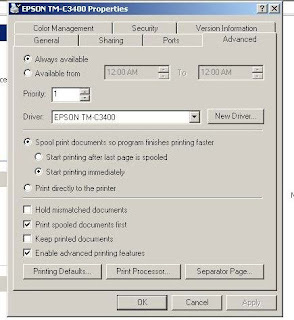 If the driver does not discover the printer, download and run the EpsonNet config utility (bottom of the tech resource guide page with the link above). 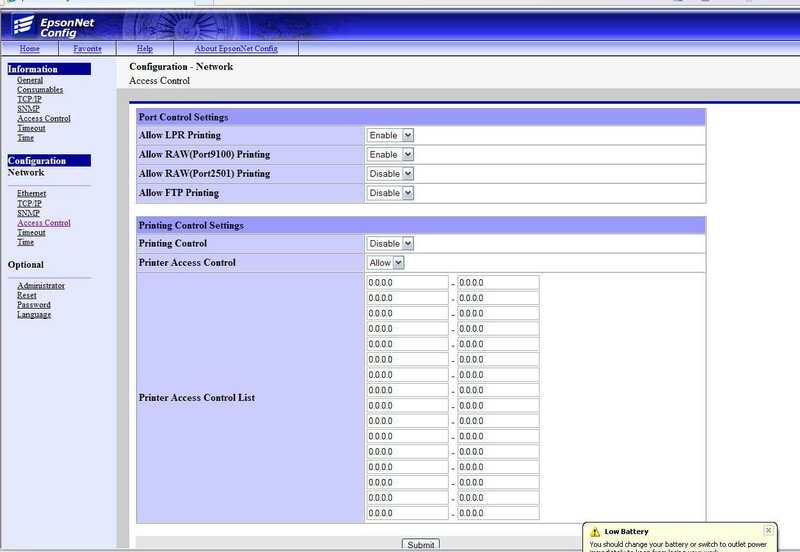 Find “access control“, enable printer access, and configure the settings identical to the picture below. Now you should be able to discover the printer. If not, contact 562-276-1314 Option #3 to get assistance. Fifth, now set the default settings of the printer. 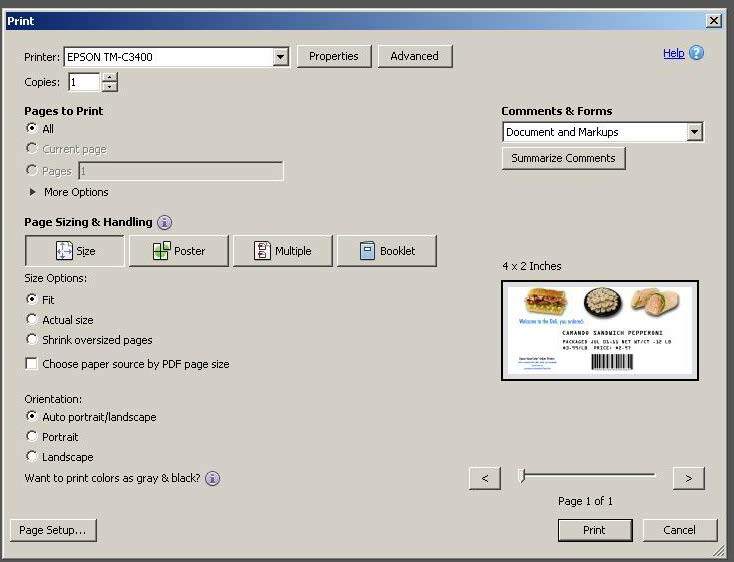 From the Start menu, go to Devices and Printers and right click on the TM-C3400 icon to select properties (XP) or printer properties (Windows 7). You will then need to select the advance tab on the properties dialog box. 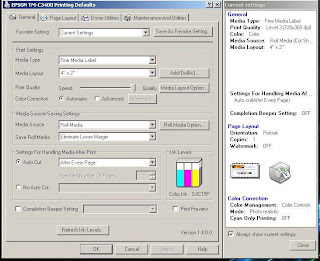 At the bottom left, you will see the “printing default” settings selection. You may want to still complete this setup even if you completed the Easy Setup Wizard. Sixth, in printer properties, go to the “Driver Utilities” tab and select “Driver Preferences”, second from the top on the left-hand side. 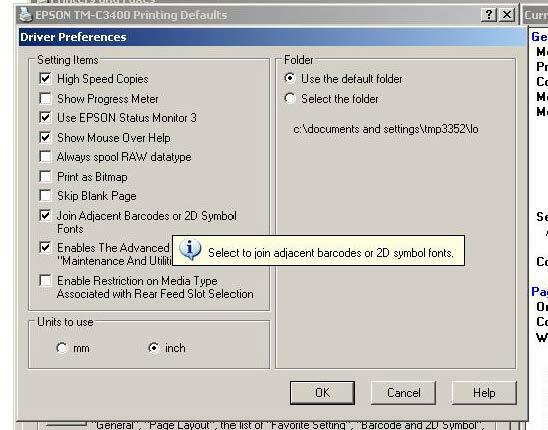 In this section, select “inches” if you want at the bottom, “Enables the Advance Function…” and Use Epson Status Monitor as seen in the image above and click OK. Seventh, and probably the issue that causes the most problems for new users, media position detection. The TM-C3400 has a gap sensor (default setting) and a blackmark sensor. 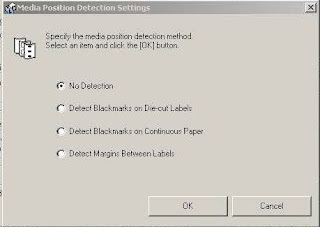 If you have continuous media and the default gap sensor setting is enabled, the printer will spit out about 3 feet of media and error. To configure this setting, go to the Maintenance and Utilities (fourth) tab, and select the Media Position Setting (top right-hand side). 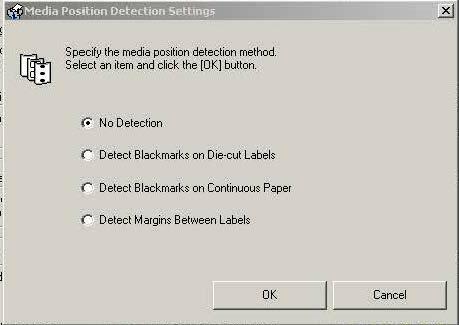 Use “Detect Margins Between Labels” for Die-Cut labels, Use “Detect Blackmark …) (for either continuous or die-cut labels) and use “No Detection” for continuous labels. Once you are finished with configuring the driver, you can replace the media that came with the printer with the type you want to use. Eighth (while on this tab), I recommend a few other settings. Notification settings, second from the top on the left, hit next and select “No Beep”. The TM-C3400 has a very loud beep for no paper, replace ink or errors. Ninth (while on this tab), I recommend you change the printer to economy mode if you are printing less than 40 to 50 labels per day. As this printer uses ink to clean, it consumes ink when on but not in use. To turn off the automatic cleaning, select “Post Printing Verification” on the top left of the Maintenance and Utilities tab, click Next, and then select the third selection down. 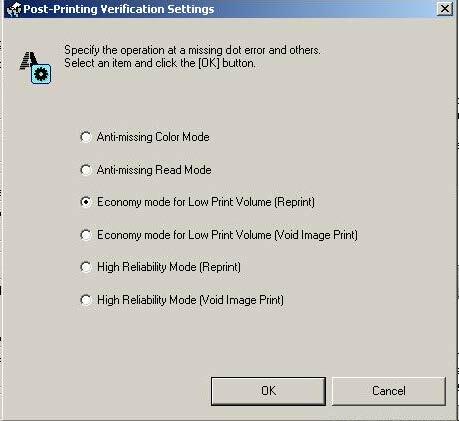 “Economy Mode For Low Print Volume”. This selection will save lots of ink, especially for resellers conducting demonstrations or testing. This selection, however, requires an extra 3 to 4 seconds per print job as the printer checks for plugged ink nozzles prior to printing. Tenth, now go to the general tab to set up the media size you require. Printing on-demand color labels is different than most desktop printers in one key way; most people print only 8.5” x 11” pages. However, labels and tags are all different sizes. So you need to set up in the Epson driver the sizes of media you want to print. 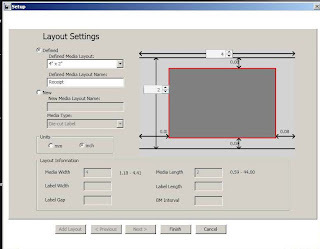 From the tech resource link above, please download the how to sheet, “Creating New Media Layouts” (the second one on the list). 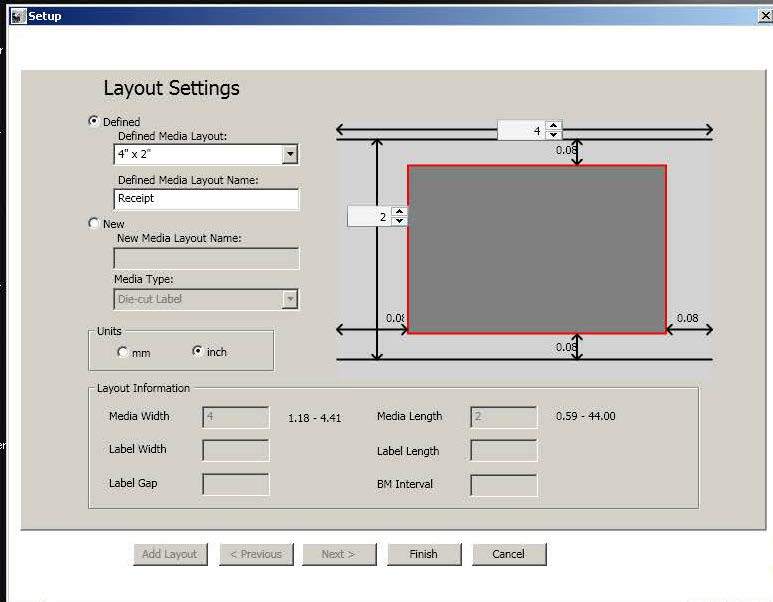 This guide provides examples of how to set up different media layouts. 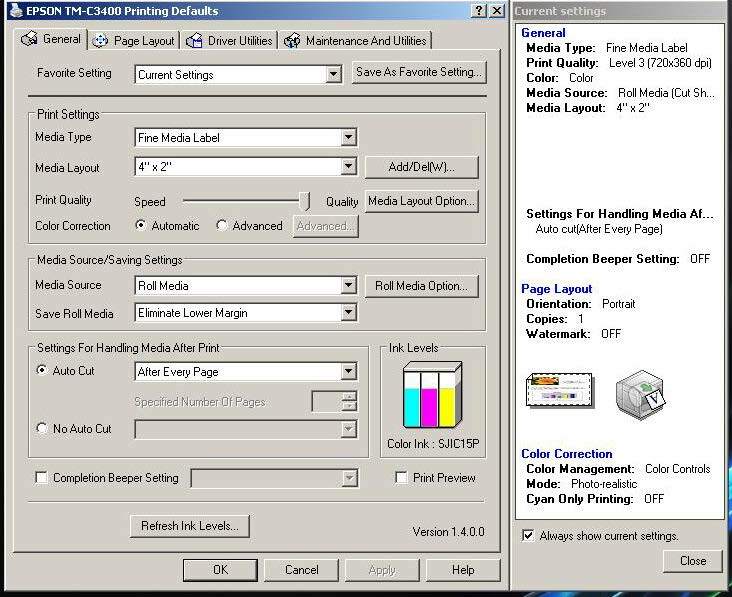 Eleventh, you can select a few other important settings: Print Quality and Auto Cut (especially for continuous media). Save roll media enables the printer to cut after (or before and after) the image rather than at the selected label length to save media. 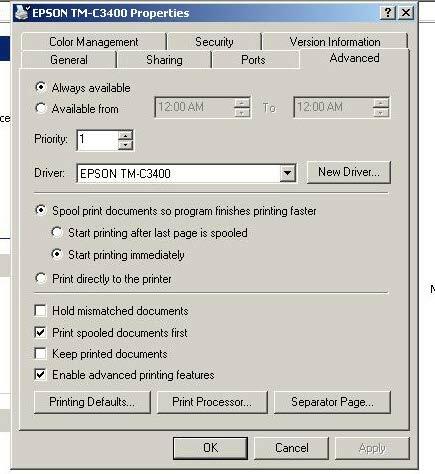 Then select OK as the printer defaults are set. Now I recommend you replace your media with the type of media you want to print. Twelve, I recommend you check the version of the firmware in the printer. To check firmware, hold down the “Feed” button while turning on the printer. You need to hold the “Feed” button the entire time the printer is starting. The latest version of the firmware is ZSE02001. If you or your customers have any other version, contact me so I can send you the latest firmware. After setting the defaults and confirming the firmware, I recommend you print a label from Adobe Reader or another Windows software application. 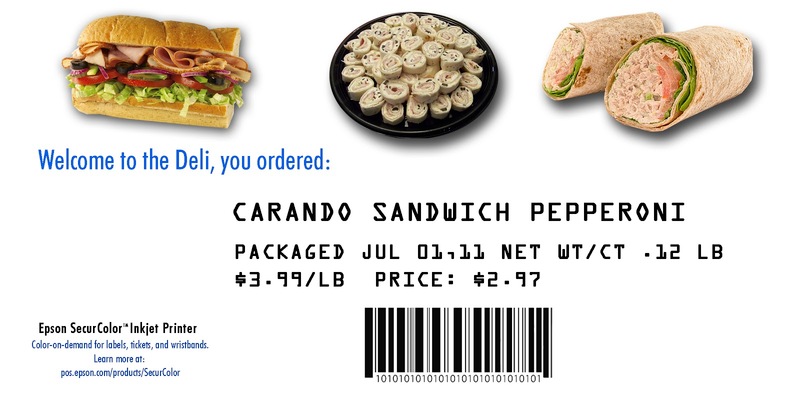 If you need an example label to print, contact me; and I’ll send you a PDF to print. Once you open up a PDF or JPEG in your application, be sure to check the printer properties. I find that certain applications don’t always pick up the defaults settings initially. Be safe and check the properties first. 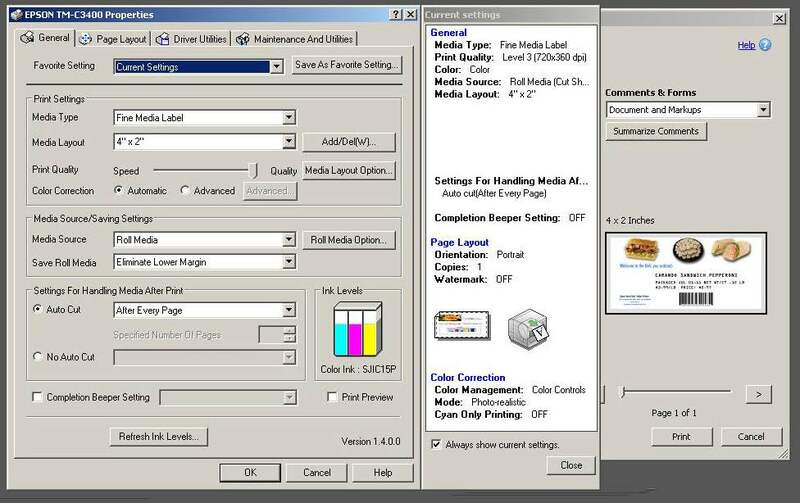 With Adobe Reader or Acrobat, the print dialog box offers two settings that make printing labels much easier; Fit and Auto Portrait/Landscape. These settings make printing labels as PDF’s (and JPEG’s using Acrobat) much easier. Once you print using Adobe Reader, you are officially ready to print from any Windows application. If you want, contact me so I can step through the initial configuration of the TM-C3400 with you. Last point; be sure to review the “Rear Feed Printing Instruction Sheet” from the link above if you plan to use fanfold media or an unwinder with a large roll. Using the rear feed printing involves changing a dip switch, inserting a plastic piece and changing a setting on the General Tab of the driver. I hope this Getting Start post makes it easier to start printing on-demand color labels. Inkjet Carts (www.inkjetcarts.us) has been selling commercial inks since 1979; adding a direct to consumer operation in 2006. Inkjet Carts’ mission is to provide the best OEM inks and easy to use delivery systems. 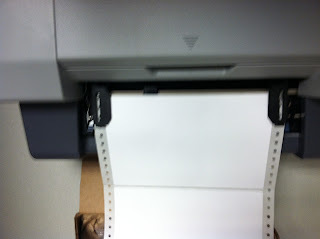 In addition, Ross says, “the Lexmark printhead used in the Primera printers does not last very long. Although it is a serviceable item, it is a pain to change. It’s better to use an Epson printer as the printhead lasts a much longer time.” You may want to look at my earlier post from Label Expo, where Primera talked to me about Lexmark exiting the inkjet business: : http://colorlabelsondemand.blogspot.com/2012/09/label-expo-2-more-merrier.html. Besides Inkjet Carts, InkCycle is another provider of refilled inks and toners using the TM-C3400. You may remember my earlier post covering their application: http://colorlabelsondemand.blogspot.com/2012/01/unique-customer-with-common-label.html. InkCycle also tried to use the Primera printer. However, they could not get this device to work on their network. In the TM-C3400, Epson uses Durabrite inks. If interested, here is a more technical summary of these proprietary inks: http://files.support.epson.com/pdf/sc80__/sc80__db.pdf. These inks are so durable, Epson has received British Marine Standard, BS5609 certification, that enables the marine shipment of chemicals when matched with Kimdura media from Neenah. To learn more, check out my earlier post on this topic: http://colorlabelsondemand.blogspot.com/2012/03/bs5609-is-no-bs.html. You may find this post on the durability of ink also interesting. 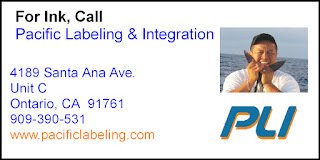 Labeling Solutions uses a poly tag with the TM-C3400 to track live-caught seafood: http://colorlabelsondemand.blogspot.com/2012/09/durability-on-demand-color.html. Inkjet Carts is testing this material from Stafford Press (www.staffordpress.com) for shelf tags. If you need durable, yet colorful labels, be sure to use pigment- based inks for your print on-demand labels. 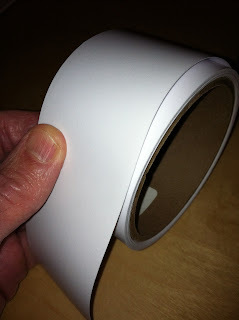 Send me a JPEG or PDF of you labels; and I’ll send you samples to test the durability of these labels in your operation. This week, I attended Pack Expo (http://www.packexpo.com/pei2012/public/MainHall.aspx?ID=1266) at McCormick Place in Chicago, IL. During the show, I had some experiences and saw some technology that you may find of interest. In their booth, Epson had running the TM-C3400, the new TM-C3400 LT (scheduled release for November) and the soon to be released, GP-C831. This product family was the same as shown at Label Expo: http://colorlabelsondemand.blogspot.com/2012/09/label-expo-1-epson-family.html. While working the booth, I spoke to representatives from an estimated 40 to 50 companies. From this group, I was surprised to hear how many of these companies needed to comply with the GHS Initiative. (If you don’t know GHS, check out my earlier blog: http://colorlabelsondemand.blogspot.com/2012/03/what-h-is-ghs-opportunity.html). 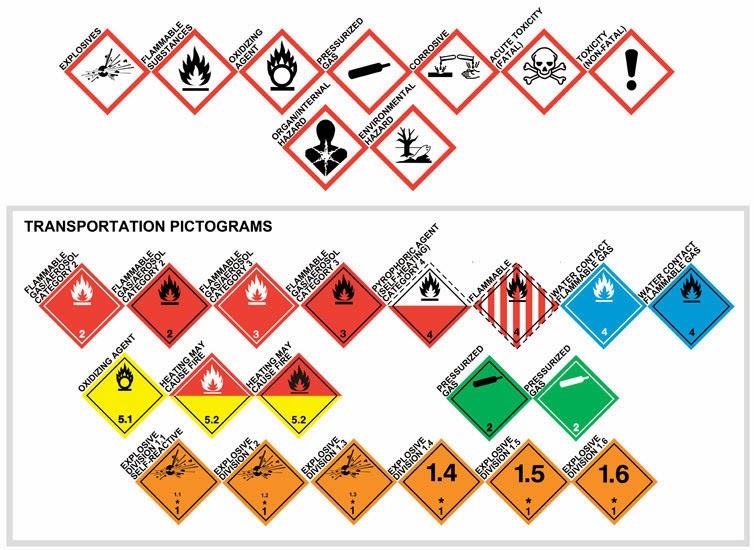 It appears many companies are facing the requirement to produce on-demand labels for chemicals with various color pictograms and icons. Including on this list are companies you may not expect: Nutrition (i.e. ascorbic acid) and Adhesives (check out my post on Dymax; http://colorlabelsondemand.blogspot.com/2012/08/complex-yet-elegant-ghs-label-solution.html. 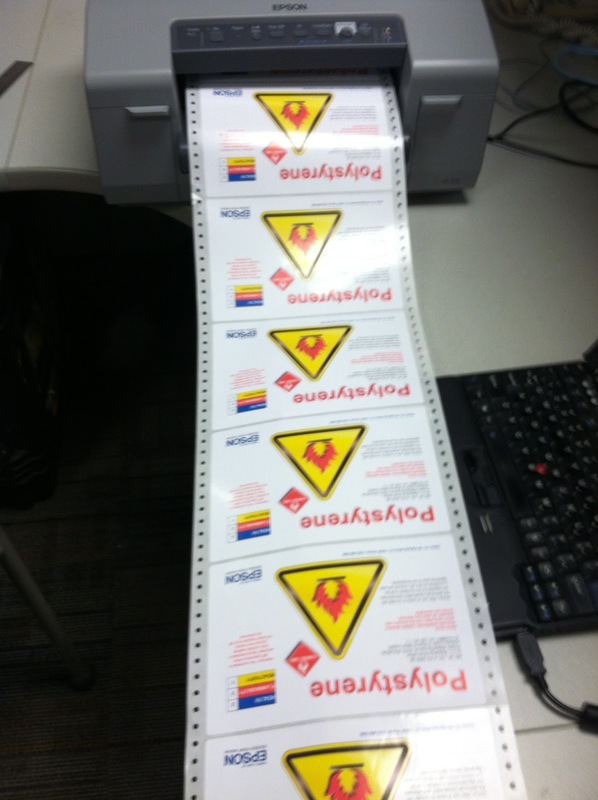 To produce these labels for drums, Epson showed the GP-C831 using Kimdura Labels. You may have seen my earlier post on obtaining the BS5609 certification; http://colorlabelsondemand.blogspot.com/2012/03/bs5609-is-no-bs.html. If you have customers who are chemical manufacturers or who use chemicals in their products, be sure to ask, “Do you need to comply to the GHS initiative?” If yes, ask “what are you plans to comply with this initiative?” I believe you may find an opportunity to help your customers meet these requirements. 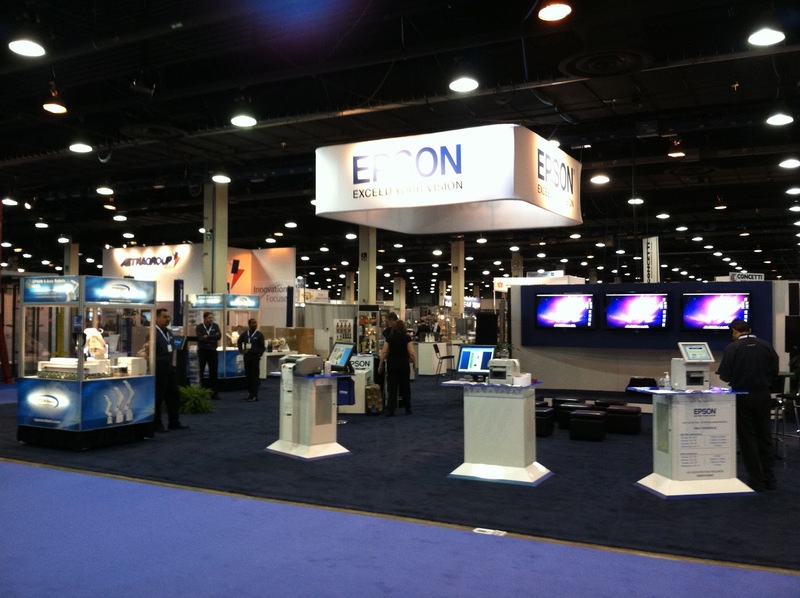 Outside of the Epson booth, I did see three relatively new items. 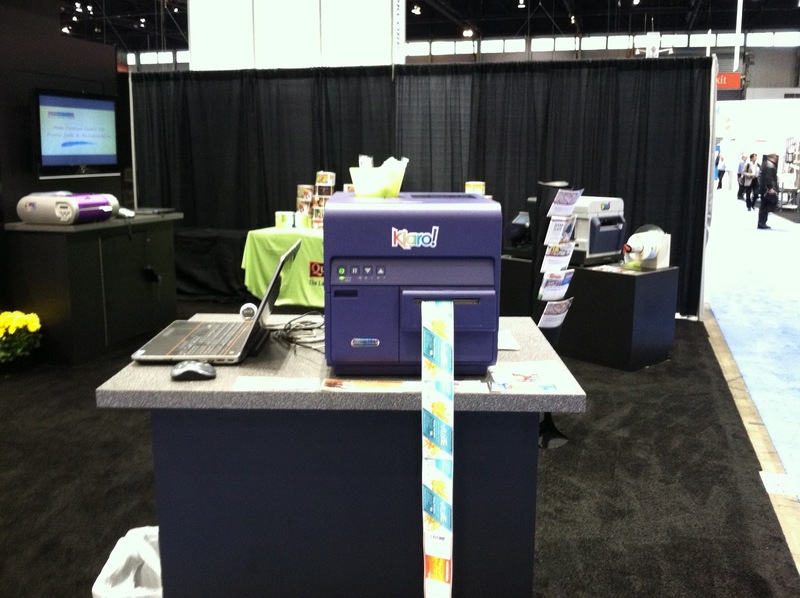 First, Quick Label Systems was showing their new Kiaro Label printer. 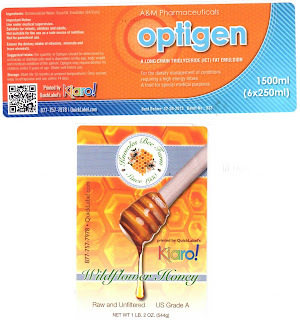 http://www.quicklabel.com/products-services/label-printers/color/kiaro.html. 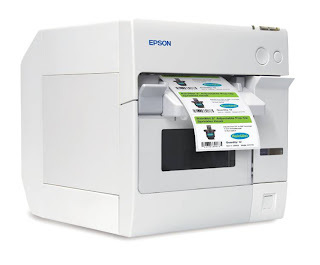 This 8” wide label printer prints at 1200 dpi resolution at speeds up to 8” per second. It costs approximately $10,000. In the booth, QLS was showing this device printing prime labels with 100% coverage. I understand this printer uses a printhead from Canon; similar to the label printers from KD Digital (www.swiftcolor.com). As QLS sells direct, most resellers will not have the opportunity to sell this printer. 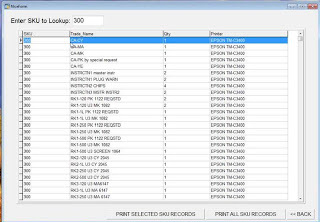 In addition, most AIDC resellers do not sell to many of the customers that print prime labels: printers, print shops, etc. Second, I saw for the first time a prototype printer from Affinia (http://www.afinia.com/l-801-label-printer) a division of Microboards (www.microboards.com). This company is using a printhead from Memjet. To learn more about Memjet, check out my previous post: http://colorlabelsondemand.blogspot.com/2012/09/label-expo-2-more-merrier.html. Lastly, Terry Zimmerman of LABELMATE USA showed me a new unwinder/rewinder capable of handling up to a 18” diameter roll. That’s a lot of labels!! Overall, Pack Expo was a successful show for me. If you attended, let me know what your thoughts of the show. Outbound Software (www.outboundsoftware.com) is a leading provider of web-based reservation, ticketing, and scheduling solutions that handles the diverse departmental needs that span an organization such as museums, zoos, aquariums, ticketed venues, and outdoor recreation. Whether the focus is on visitor services such as admissions, group sales, education, development, rentals, special events, tours, workshops, or other areas, Outbound Software’s solution is nimble enough to handle the nuances of the services and the disparate needs of an attraction organization. On October 25th and 26th, Marc Jorrens, Co-Founder and President of Outbound Software invited me to participate in their first annual user conference. 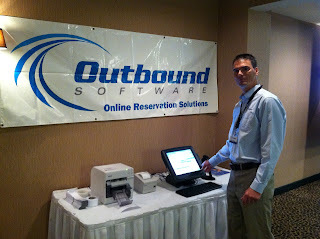 At the conference, I had the opportunity to learn more about Outbound and their customers. 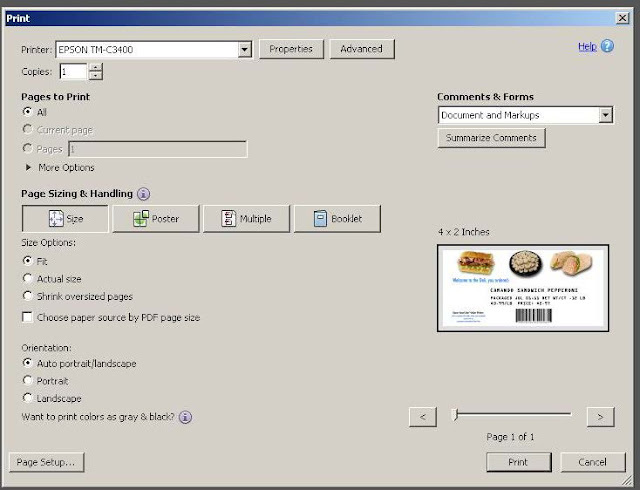 Just recently, Outbound decided to integrate the TM-C3400 into their software; and wanted me to demonstrate and talk about print on-demand color tickets and wristbands. According to Marc, “I saw an opportunity to differentiate our product by enabling customers to print on-demand; and eliminate preprinted tickets. Since completing the integration, I have found the small Epson printer produces great color tickets that are instant waterfast and very durable. The pigment-based ink is great”. During the Outbound event, I spoke to customers with 4 different types of requirements for print on-demand color tickets. First; promote special events. Many types of attractions have special events; both large and small. Producing tickets positions the event in the minds of the attendees as “special” enabling the tickets to act as mementos. Adding images, graphics, logo’s, etc. signify the importance of this special event; creating more value. Second, honor sponsors. With print on-demand color tickets, attractions can honor sponsors; making their sponsorship more valuable. Many non-profit attractions need sponsors to cover portions of the operating costs. Therefore, these non-profits need to find ways to increase the value of the sponsorships offered. 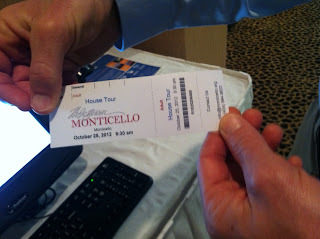 By using print on-demand tickets with logo’s and recognition, the sponsor gets more value. Third, change processes. Print on-demand enables attractions to change selected processes. During the Outbound event, I spoke to a controller for a military attraction. This organization uses wristbands to track approximately 240,000 annual paid attendees. As wristbands act as “currency”, the organization must track the wristbands precisely. They hold an inventory of several colors of wristbands (different color per day); take inventory at the beginning and end of each day; and reconcile the inventory with the paid attendance. This process takes a significant amount of time and effort. By moving to print on-demand wristbands, they now can keep only a small amount of blank inventory that has no value. When printed at the point of sale, the serialized and barcoded wristbands become the entrance ticket. Once attached to the attendee, guards can scan the wristbands easily and quickly completing a reconciliation process. 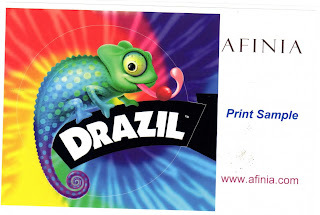 If you or your customers use tickets or wristbands somewhere in the operation, consider how print on-demand color enables new procedures and promotions; saving attractions money and enabling greater revenues. At the end of November, Epson America will ship the GP-C831 pin-fed, inkjet printer. Given the pending release of this new product, I thought you might find interest in my personal experience in printing with this new device. Epson first showed this printer at Label Expo in September. You may remember my post covering Label Expo: http://colorlabelsondemand.blogspot.com/2012/09/label-expo-1-epson-family.html. In addition, Epson America issued a press release covering the demonstration of this printer at the upcoming Pack Expo tradeshow: http://pos.epson.com/ColorWorks/packexpo/?ref=van_packexpo_2012-10-001. If you are attending, please let me know. Let’s meet at the show. 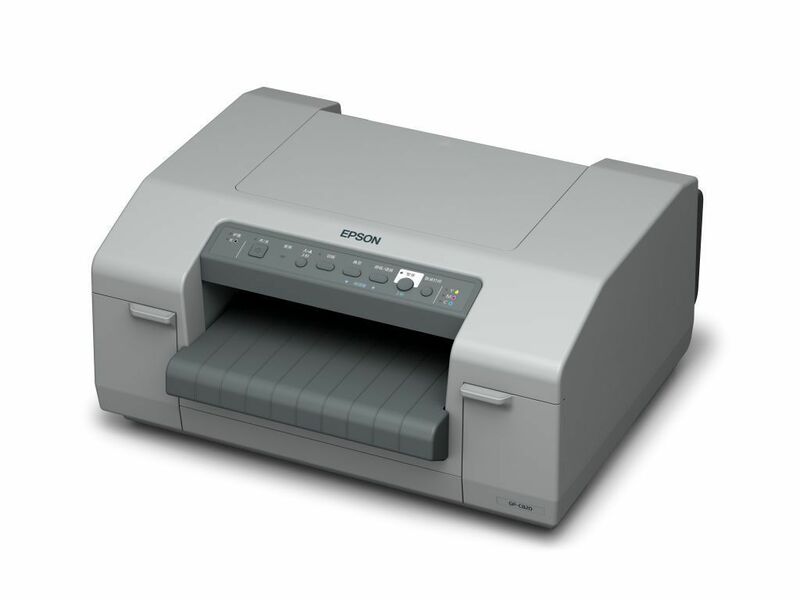 To learn more about the specifications of the GP-C831, check out the new Epson America webpage. http://pos.epson.com/colorworks/C831.aspx. As I said earlier, I decided to test this new printer myself. I installed the driver and loaded the pin-fed media. Then I set the print resolution; at the normal setting using plain media and the quality setting. And the first labels looked great. Then I decided to print 10 at once; where I learned that I needed to have the exact size from perforation to perforation. With the difference in the driver setting from the actual size, the labels became misaligned. Once I realized that I needed a custom label size, I went into the driver and set up a new page size; 9.5” x 5.63”. When I printed 10, all worked of the labels looked perfectly. In fact, I printed 10, 8” x 5.5” die-cut labels at the normal setting in 28 seconds. Seemed pretty fast to me! And printed. In fact, I printed 10, 8” x 11” die-cut, poly labels at the normal setting in 45 seconds. Again; pretty good! And the labels looked great! And here is a video of the printer running. http://colorlabelsondemand.blogspot.com/2012/03/what-h-is-ghs-opportunity.html . Basic GHS Info. http://colorlabelsondemand.blogspot.com/2012/03/bs5609-is-no-bs.html . BS5609 Certification Info. http://colorlabelsondemand.blogspot.com/2012/04/chemical-solutions-solutions-for.html . Flourochem and Hank Solutions. In addition, the GP-C831 may work for other types of applications; including reports, shipping documents, signs; where end users want to add color, but at a significant less cost than using color laser printers. If you or your customers need labels wider than 4.4”, consider the GP-C831. Contact me now to discuss how this printer will fit your application requirements.